Torque nuts can be used to protect parallel sided cracks. Their shape means they can be used in multiple orientations, giving you a wide range of placement options with every piece. Lightweight aluminium alloy construction means that despite their low weight, each Torque nut has 14kN strength rating. Torque nuts work all conditions. They are especially useful in winter, when cracks are icy and so cannot be protected with cams. An extendable sling lets you reduce rope drag without extra quickdraws, and can be replaced with DMM's in-house re-slinging service. 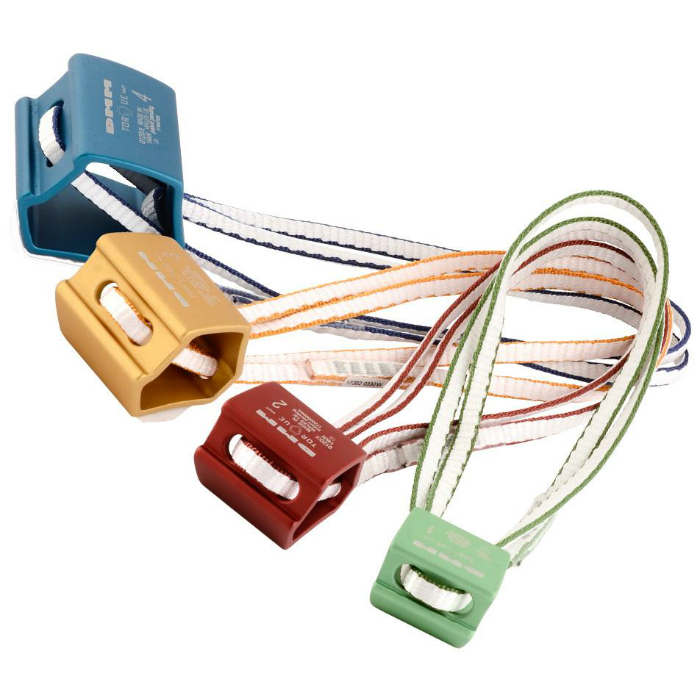 The DMM protection range is color coded for quick and easy size selection. Colors are co-ordinated across passive and active protection, for quick selection of alternatives if your first choice doesn't fit. 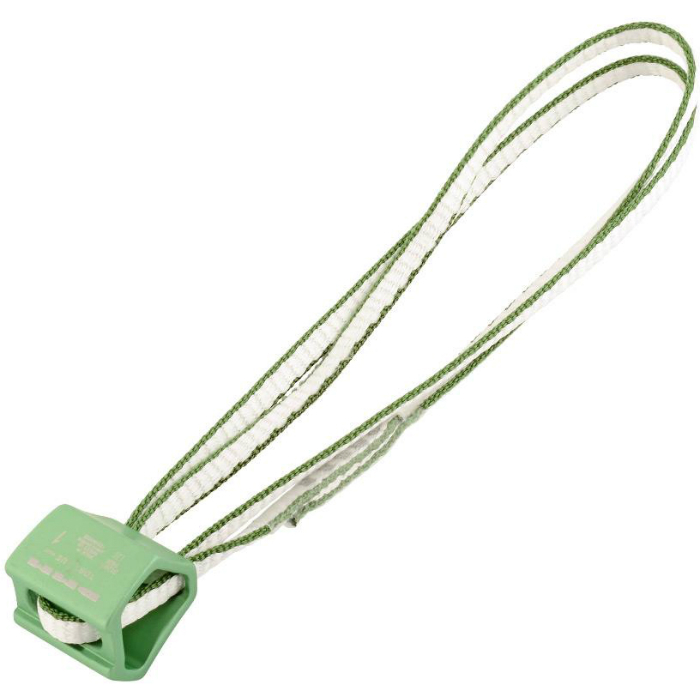 Extendable slings allow speedy placement extension without additional quickdraws. Extending placements reduces rope drag when routes change direction, move round corners or over roofs. Simply rack each cam on its own carabiner for a self-contained system that is quick and easy to extend. Carrying less quickdraws minimises rack weight on your harness. Torque Nuts can be placed in multiple orientations, allowing each piece to fit several sizes and shapes of crack. The numerical size as stated by the manufacturer/brand. Generally the size will be between 1 and 15, but there is no standard, so each "3" you see could have totally different dimensions. For quick size identification purposes. Sometimes the head of the hex is not anodized, in this case, the stated color will come from the sling. In kilonewtons, the passive strength as stated by the manufacturer/brand. All hexes are rated in passive strength, instead of active strength like cams. This field refers to the hex head. A majority of hex heads will be 6061-T6 Aluminum, but we don't write that in all willy nilly and only have input here after we've confirmed the material with the manufacturer/brand. The material that takes up the majority of the "sling." Note: If a hex has a wire sling with tubular protection, we just call this "wire." Similarly, when we say "Dyneema" this does not mean the sling is 100% Dyneema. It will be some combination of Dyneema and nylon (there are no 100% Dyneema slings). Since you cannot dye Dyneema, the colored portion of the sling is made of nylon. This is measuring the minimum length on the small side of the hex, and the maximum size of the widest part of the hex. DMM describes all the features and design details of the Torque Nuts. Instruction for using DMM Hex and warnings, maintenance and lifespan with instructional pictures. A pictoral representation of the UIAA-124 and EN-12270 standards for chocks (which includes nuts and hexes).